Things they didn’t tell Amazon. The only definitive statement that you can make is about something that’s already happened, which is why I spend a lot of my time thinking about the past in pursuit of informing my journey through the present and into the future. Since the Mayor and Governor seem to have found common ground on the subject of Amazon coming to LIC, and announced their intentions to offer the company a kings ransom in tax breaks and other incentives to base their second HQ here in Long Island City, on a huge campus located adjacent to the so called Anable Basin, a lot of people have inquired as to my positions and thoughts on the matter. Dire implication of pending doom, or a bright future? Let’s get to it then. The shot above looks down 44th drive, towards the East River and Manhattan. Above is a fire insurance map section of Anable Basin’s (labeled “canal”) neighborhood in 1919, depicting the land use of one century ago. If you click it, the link will carry you over to Flickr, where a larger incarnation of the thing can be zoomed into for deeper perusal. The Standard Oil properties above were an operation called DeVoe, which I understand to have primarily been a canning and packaging facility for petroleum products and chemical byproducts that were refined at Standard’s several refineries to the east and south, and notably those along the nearby Newtown Creek. The shots below depict scenes more recent, 2009 specifically. 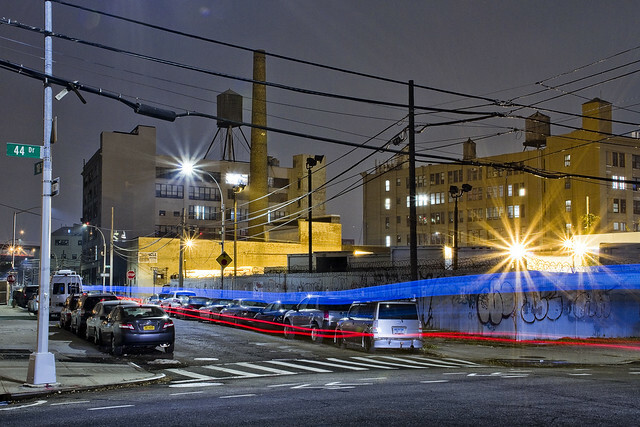 Back when I first started wandering around LIC with a camera, I really didn’t understand the things I was looking at nor the complicated web of connections and tangents that were directly in front of me. Often I would gain a moment of insight, saying “that looks like it might be important to get some shots of,” as is the case with these now decade old shots. At the time, the land on the southern side of Anable Basin was an open field of post industrial rubble and construction equipment, fenced in with gated entrances that displayed signs saying “NYS DEC Brownfield Remediation site.” It took better than two years, and millions of dollars (and a bit of epic legal trickery) before environmental officialdom could sign off on Rockrose Development’s plans for the site. 9.5 acres, and owned by Rockrose Development (which has recently transformed itself into another corporate entity), this is the future home of four residential towers. As of April 2008, some 80,000 tons of contaminants had been removed from the site at a cost of $31 million. Standard Oil sited an oil refinery here in the 1860’s, and the soil is contaminated with Benzene, Petroleum Distillates, and volatile organic chemicals whose detected presence – in trace amounts- would cause the regular NYFD to evacuate and call in their HAZMAT teams. Additionally, generations worth of untreated sewage and industrial pollution swirl and mix with the water table of the East River in the deeply cold gravels and blackened mud beneath the place. 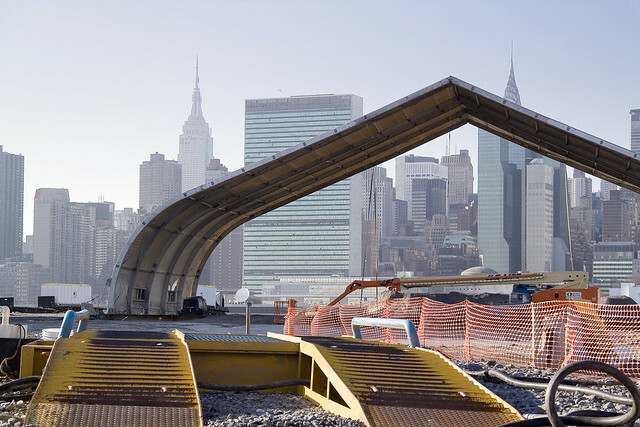 Sources also reveal that the “clean fill” being used to replace the contaminated substrates that were removed in the remediation process emanate from the tunnel being bored out from under the East River by the “East Side Access” project. 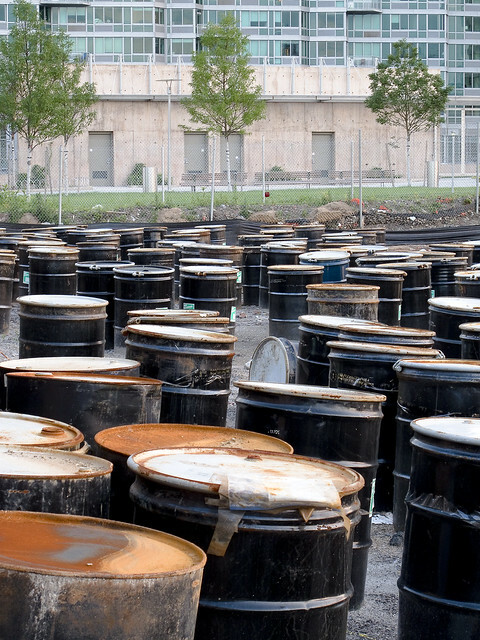 Additionally, the photo directly below is from a bit earlier in 2009, June 29 to be specific, and depicts the dozens and dozens of steel drums that contaminated material which had been removed from the ground in the first pass was stored in onsite. 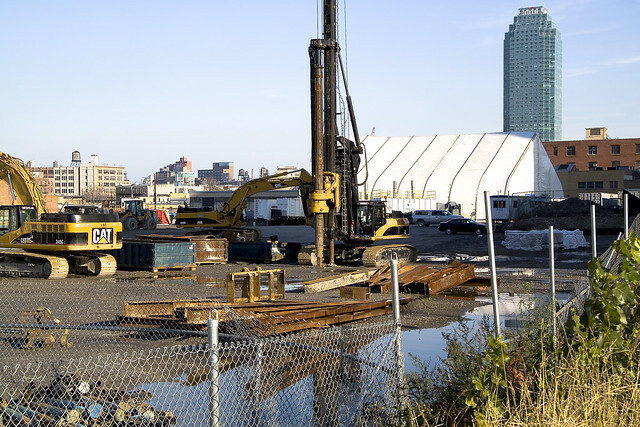 If you live in that large residential tower in LIC that’s found at 45-45 Center Blvd, well… guess what? They didn’t mention this, or any of the other inconvenient environmental truths about LIC, to you before you moved in? They’re probably not revealing it to Amazon or their employees either. Looking north at the corner of 44th drive and 11th street, there’s a light industrial zone that has somehow survived having the real estate folks picking away at it over the last couple of decades. It’s been nibbled in at the edges, which I’d define as being 23rd street to the east, the Queensboro Bridge to the north, East River to the west, and 44th drive to the south. It’s an area composed of truck based warehouse businesses, light manufacturing, food preparation, construction contractors. 11th street’s southern end terminates in the onramp to the Pualski Bridge, the gateway to North Brooklyn. 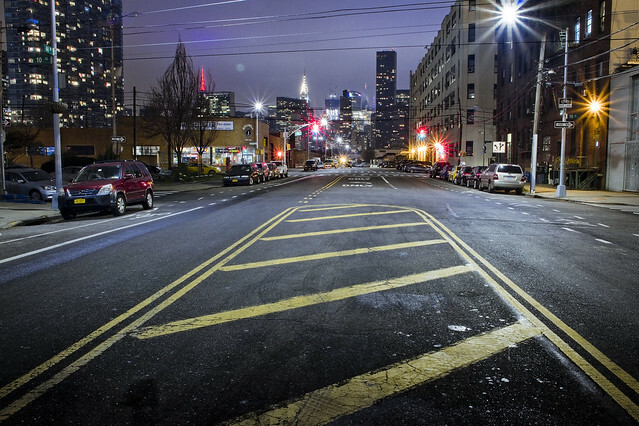 Amazon’s presence will make this area “the next big thing,” development wise, and its presence will definitely heat up the already red hot real estate market of North Brooklyn as well as the similarly fevered one here in Queens. Don’t be surprised if this industrial zone is remade into Manhattan style office buildings and hotels. Also, don’t be surprised if nearby civic groups welcome it, in return for crumbs from Amazon’s table, and the hotels become homeless shelters after a year or two. That’s 44th Drive’s intersection with Vernon Blvd. which will all be part of the Amazon campus. Don’t ask how many feet of water were sloshing about here during Hurricane Sandy, or about the complaints often offered to the City DEP by residents about sewage backups that occur during ordinary storms. Certainly, don’t tell Amazon about it. Until quite recently the goal of the Real Estate Industrial Complex, as led by the NYC EDC, was to develop this intersection as high density residential, and to give the government owned land away to a developer for the price of a handshake. Don’t worry about the developer, they’re the ones that are going to build the Amazon campus. 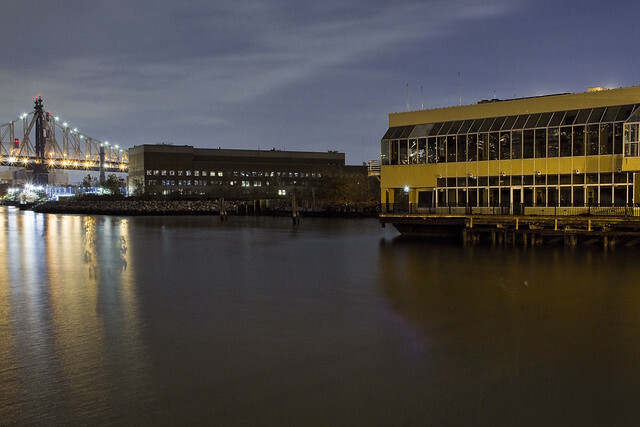 They also got a sweetheart deal on a property adjoining Newtown Creek where they’ll be allowed to erect four twenty story tower apartment buildings. Win, win! The huge NYC owned building at the corner of Vernon Blvd. and 44th drive is officially a NYC Dept. of Education facility. Currently, it houses some 1,000 plus employees of the Office of Pupil Transportation (the School Bus people, who are coincidentally having their $1.2 Billion operation investigated by the FBI under charges of rampant corruption), the Division of School Facilities (responsible for construction of new schools and maintenance of existing structures), and the Office of Food & Nutrition Services (School Lunch people, who feed around 1.1 million students a day). 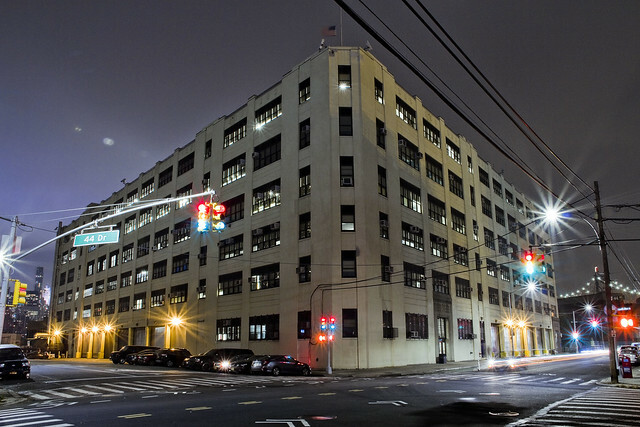 Now, if you’re someone like me (which is unlikely), when you look at 44-36 Vernon Blvd., you don’t see the Department of Education building, instead you see a late 1930’s Work Projects Administration built City of New York Department of Purchase and Bureau of Stores warehouse. Construction began in 1938, if you’re the curious type. I am. Continuing west down 44th drive, you encounter a lonely and sort of scary street. While these shots were being captured, there was one automobile being utilized as a boudoir, and in another there was a group of teenagers who were experimenting with cannibinoids. A few workers sidled past me and shot “the hairy eyeball” in my direction. This section of 44th drive, found between Vernon Blvd. 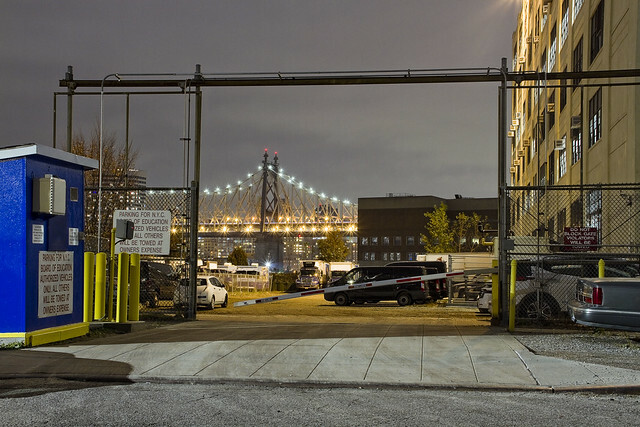 and the East River, is a little scary at night but no different than many of the streets you find in the peninsular sections of Hunters Point. 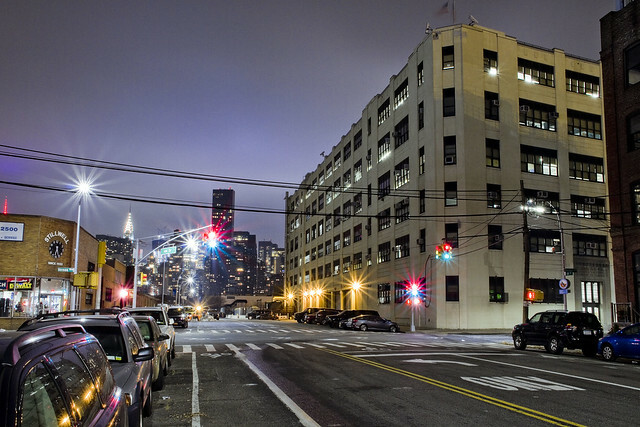 Hunters Point is the actual name of this area, not Long Island City. 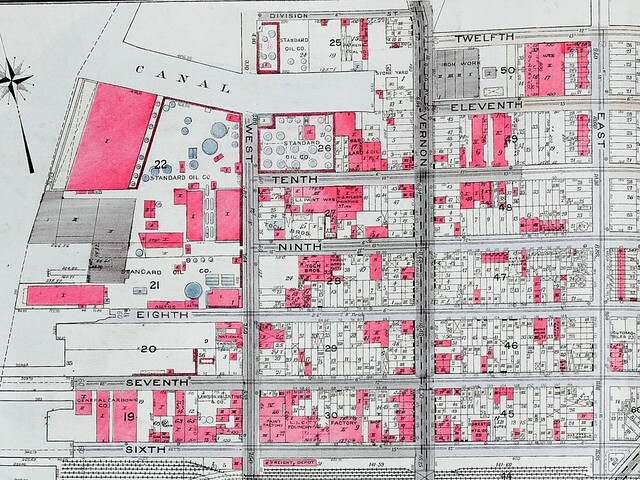 Long Island City, as it were, encompassed a vast area which included parts of Middleburgh or LIC Heights (modern day Sunnyside), all of Astoria, Blissville, Hunters Point, Dutch Kills, and Ravenswood. 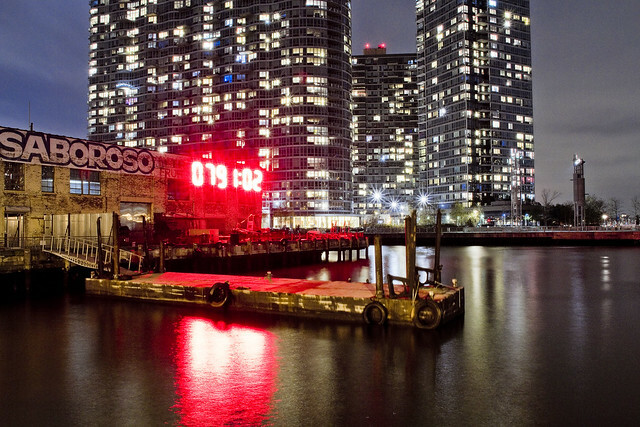 If you live west of Woodside Avenue or 51st street and your zip code starts with a “111,” you live in the former municipality of Long Island City, which was absorbed into the City of Greater New York along with the rest of Queens back in 1898. Referred to at the time by citizens of what became the outer boroughs as “The Great Mistake,” Manhattan’s interests have been primal ever since. Ravenswood, as a note, is the neighborhood on the other side of the Queensboro Bridge as you move northwards along Vernon Blvd., and Astoria starts somewhere between 35th and 34th avenues. Roughly analogous to 5th street, the DOE building has a huge parking lot for its employees which will also become a part of the Amazon campus. This view looks north, through the open gates of the facility towards an empty property. Said property had a building on it which was demolished in anticipation of real estate development, but funding for the project fell through and it was allowed to grow wild with self planted vegetation. Looking south along 5th street, which is hardly a street and more of an access drive that’s one block long, is the intersection with 45th avenue (labeled as “Division Street” in the map at the top of the post). 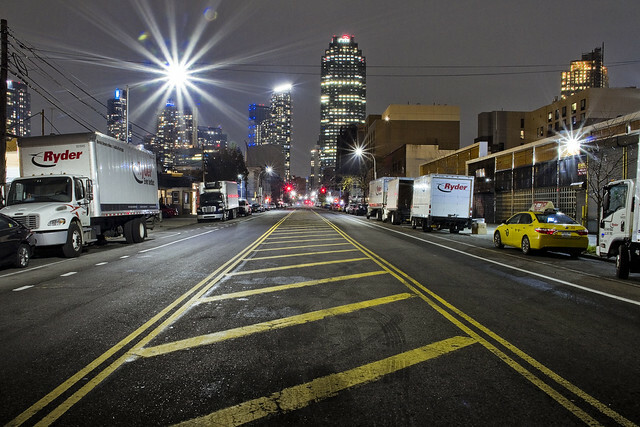 The area is defined by a large NYC DOT yard, one devoted to roadway resurfacing and asphalt spreading operations. When manufacturing declined as an economic sector in NYC during the 1960’s and 70’s a lot of formerly valuable waterfront property owners ended up either in bankruptcy or unable to pay their taxes, and the City ended up foreclosing on or just taking over their abandoned properties. 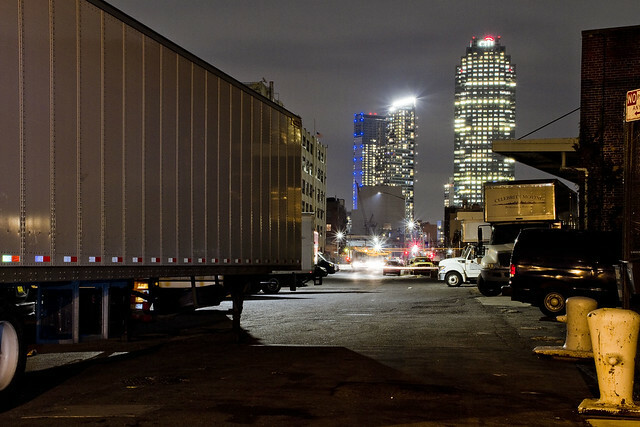 In order to bring some sort of economic life to these depressed post industrial zones, and free up more valuable land in Manhattan, NYC began to base its’ service fleets in these centrally located areas. Starting in the 1990’s, these waterfront lots and parcels began to be considered valuable again, but the City couldn’t afford to relocate them elsewhere as real estate valuation had risen. 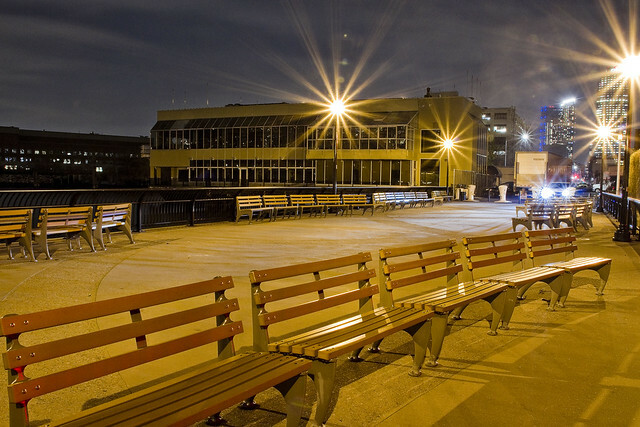 All over the Brooklyn and Queens waterfronts, you’ll find facilities like this DOT yard or the DOE building across the street. 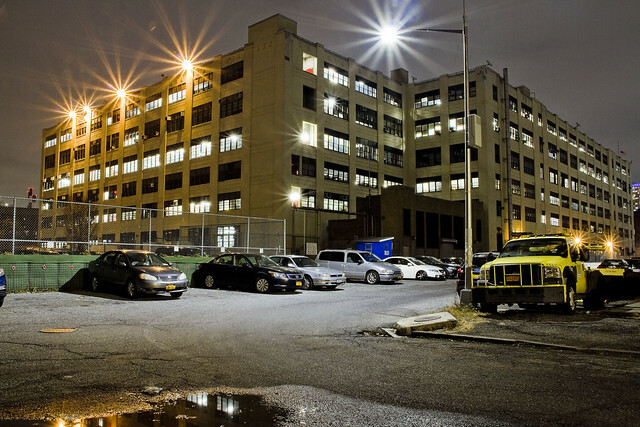 The so called “movement” to replace the jails complex on Rikers Island has nothing to do with “mercy” or “justice,” and everything to do with resiting municipal facilities operated by DEP, DSNY, NYPD, FDNY, and so on from valuable parcels in hot real estate zones. You can’t build tower apartments on Rikers, it’s near an airport and very far from mass transit other than buses. 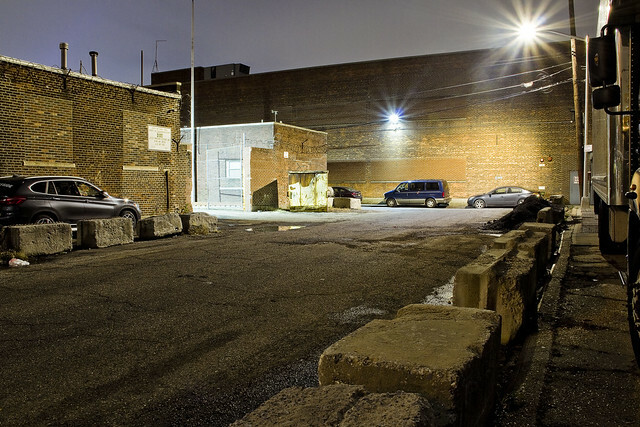 You can build one and two story garages and warehouses for City owned vehicle and equipment fleets, though, ones which will be safe from prying eyes at the end of a causeway bridge in East Elmhurst. Continuing towards the waterfront, you encounter a recreational pier with seating and benches, after passing by the entrance to an “eating and drinking” establishment called the Anable Basin Sailing Bar and Grill. It’s seems to be a pretty popular destination during the summer, that bar and grill. Anable Basin itself is on its southern flank, which is bordered by that benzene laden construction site and the tower building built atop it on the other side of the canal. Looking at the waterfront properties, from that recreational pier, which the Amazon Campus will be observed from by residents of Manhattan’s Upper East Side and visitors to Roosevelt Island’s Four Freedoms Park. The building at the right of the shot is one which our Mayor would likely celebrate the demolition of – the Waters Edge restaurant. The former owner of the restaurant testified to Federal Prosecutors about rampant political corruption at City Hall, and directly about his “pay for play” interactions and transactions with the Mayor himself. Mayor De Blasio seems to have escaped charges “by the hair of his chiny chin chin” by exploiting the technicalities of election law. Read about it here. One of the many decisions undertaken by the Trump Administration which I disagree with was the firing of U.S. Attorney Preet Bharara, who was in the process of investigating and tightening the prosecutorial noose – which jailed Sheldon Silver and Dean Skelos – on our Mayor and on our Governor as well. Bill De Blasio and Andrew Cuomo actually owe their reputations and freedom to Donald Trump firing Bharara, which would be an ironic fact at any other time. Looking north along the East River coastline past Water’s Edge, Lake Vernon, a large Con Edison training facility, and the gas powered electric generation turbines found nearby the Queensboro Bridge and just south of the Queensbridge NYCHA houses. 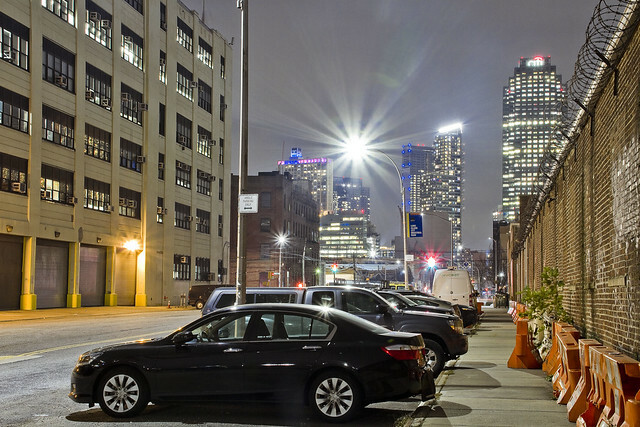 The shot above looks up 44th drive, towards the Sapphire Megalith of Long Island City, and the Court Square area. It’s literally the other direction of the first shot in this long post. The megalith, which has been occupied by Citi Group since it opened some 26 years ago, will be the temporary home of Amazon’s HQ2 until construction on the LIC campus winds up sometime in the middle 2020’s. So? What do I think about Amazon coming to LIC? I still haven’t formed an intelligent opinion or gleaned any nuance, but now I can intelligently say what used to be and is here, and why. Now, you can say that too. What do you think about this subject? What else hasn’t Amazon been told by the snake pit of New York politics? Poisined Land for Amazon it will get for its tax breaks.